Cortical bone and cancellous bone are two types of osseous tissues of the human skeleton which differ in their structure and distribution. The difference in their structures and distribution is designed to carry different functions. Cortical bone refers to the thick outer surface of typically a long bone [for example humerus or femur shaft] that ensheathes the cavity of the bone called medulla. The sheath or outer shell formed by the cortical bone is called cortex. Cortical bone is also called compact or lamellar bone and provides strength to all the long bones of the body, for example, femur. Cortical bone contributes about 80% of the weight of a human skeleton. It is much denser than cancellous bone, harder, stronger and stiffer. At the microscopic level, the structural arrangement of a cortical bone is different than cancellous. Compact bone consists of closely packed osteons or Haversian systems. The osteon consists of a central canal called the osteogenic (Haversian) canal, which is surrounded by concentric rings (lamellae) of the matrix. Between the rings of the matrix, the bone cells (osteocytes) are located in spaces called lacunae. Small channels (canaliculi) radiate from the lacunae to the osteonic (Haversian) canal to provide passageways through the hard matrix. The Haversian systems are packed tightly together to form what appears to be a solid mass. The osteonic canals contain blood vessels that are parallel to the long axis of the bone. These blood vessels interconnect, by way of perforating canals, with vessels on the surface of the bone. Cancellous bone is also called trabecular bone or spongy bone. Compared to compact bone, which is the other type of osseous tissue, it has a higher surface area but is less dense, softer, weaker, and less stiff. It typically occurs at the ends of long bones, proximal to joints and within the interior of vertebrae. For example, distal end radius, proximal humerus or proximal femur, all are examples of cancellous bone. Microscopically, cancellous bone consists of plates (trabeculae) and bars of bone adjacent to small, irregular cavities that contain red bone marrow. The canaliculi connect to the adjacent cavities, instead of a central Haversian canal, to receive their blood supply. It may appear that the trabeculae are arranged in a haphazard manner, but they are organized to provide maximum strength similar to braces that are used to support a building. The trabeculae of spongy bone follow the lines of stress and can realign if the direction of stress changes. Cancellous bone has a greater surface area and is ideal for metabolic activity e.g. exchange of calcium ions. In osteoporosis, cancellous bone is more severely affected than cortical bone. Cancellous bone is highly vascular and frequently contains red bone marrow where hematopoiesis, the production of blood cells, occurs. Bone marrow also acts as a source of stem cells. Both cortical and cancellous bones together form the skeleton and serve their respective functions. Bone is a important thing on our body parts as I think That is why we need know about bone as well. In this post you’ve shared some important info about the Types of Bone – Cortical and Cancellous as well. This is really effective to all. Thanks!!! Great job summarizing and comparing the two types of bone tissue. 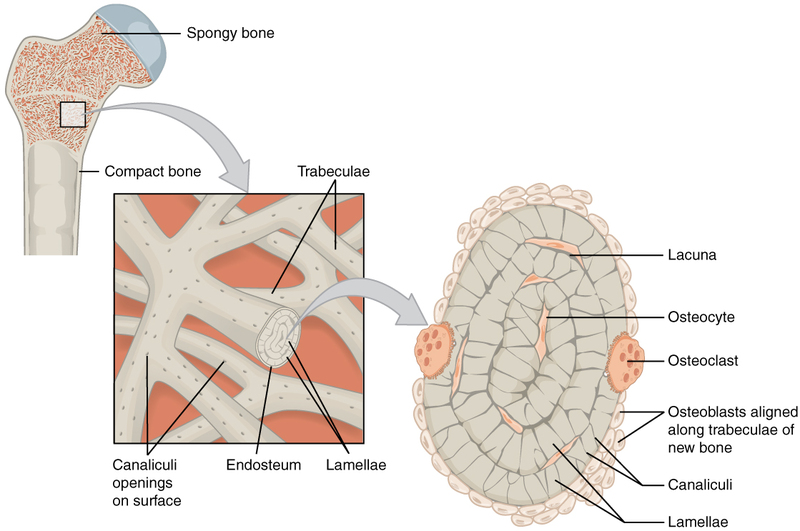 I’m just unsure about the last paragraph which states that cancellous bone is highly vascularized, as spongy bone does not contain blood vessels. I am glad Bhagyashree it helped you. Thanks for the appreciation. Cancellous bone is very vascular. It has to be because it is the place where blood cells are formed by marrow. Would cortical and cancellous bone explain color variation on an MRI? Black vs very light gray? Or would light gray almost white coloring be of concern on an MRI? The cortices are blacker, medulla almost looks similar. The concern should arise if the difference is focal rather than widespread. If you are able to put across your specific concern, I would be in better position to reply. I wish I had a second look at the MRI because then I would have measured certainty of what I’m relating to you. But for discussion sake, let’s pretend that’s the exact concern of the bones mentioned. I do recall him saying possibly osteomalasia? He ordered blood work as precaution, vitamin D and calcium, all minerals were nominal. So what could be left or overlooked? I’ll get better information if necessary. Thanks so much for your input! I understand that you are concerned about something doctor said but there are too many ifs and buts to answer it in proper way. But I do understand that sometimes incidental findings could also be significant. I think the best way is to discuss it with the treating doctor, understand the concerns raised and their implications. If there is an MRI finding that bothers, review of the image from radiologist can be asked. Please talk to your doctor and ask it is wiser to investigate further or okay to wait and watch.